$Signed a four-year, $29 million contract with the Bills in March of 2019. Beasley intends to sign a four-year, $29 million contract with the Bills, Mike Garafolo of NFL Network reports. The Bills have beefed up their wideout corps in a hurry, adding Beasley and John Brown to a group that previously had minimal depth behind Zay Jones and Robert Foster. The team now has four wide receivers who can make a legitimate case for regular snaps, though it's safe to assume Beasley will be signed with a consistent slot role in mind. Dividing playing time outside between Brown, Jones and Foster figures to be the greater challenge, and there won't be a ton of catches to go around unless Josh Allen improves his accuracy. 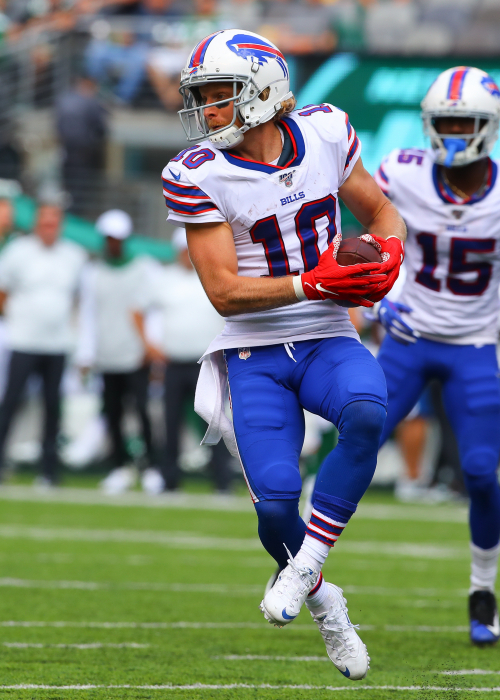 How do Cole Beasley's 2018 advanced stats compare to other wide receivers? See where Cole Beasley lined up on the field and how he performed at each spot. How do Cole Beasley's measurables compare to other wide receivers? Overshadowed by Dez Bryant, Ezekiel Elliott and Dak Prescott, Beasley quietly had an excellent year -- 8.5 YPT, 75 catches and five TDs on only 98 looks. Beasley's not going to break off many big plays -- only two 40-yard catches in his entire career -- and he's too small (5-8, 180) to be a red-zone threat. However, with 4.49 40 speed, excellent quickness, strong routes and good hands, he's become a reliable possession receiver, and more importantly, one who has a rapport with Prescott. While Beasley had only one game (Week 1) with double-digit targets, he also never had fewer than four targets in any game, and he had at least four catches in all but three games -- in PPR formats, Beasley has a nice floor. The Cowboys didn't add any skill players of note to their offense this offseason, so Beasley should reprise last year's slot receiver role. The diminutive slot receiver is coming off his best season in the NFL, including an impressive 112-yard, two-TD performance in Week 9 against the Eagles, but much of his production last year came when Dez Bryant and Tony Romo were sidelined and the Cowboys were scrambling to patch together a passing attack. Beasley's elusiveness can make him dangerous, but when everyone is healthy there won't be enough targets available for him to be an asset in many fantasy formats. It's hard to envision a lot of upside for the 5-8, 180-pound slot man, but he has a few things going for him this year. First, he signed a four-year, $13.6 million deal, meaning the Cowboys are at least moderately committed to making sure he's involved. Second, his primary competition for throws in the short areas of the field, Jason Witten, is now 33 and has seen a drastic reduction in his volume the last two years. Third, Beasley has passable speed (4.49 40), excellent quickness and plus athleticism. Fourth, the departure of DeMarco Murray and his 392 carries could alter the run-pass split for the Cowboys slightly. But that's about the extent of it. Beasley won't be a factor in the red zone, and will be no better than the team's distant third passing-game option behind star Dez Bryant and Witten (and could be the fourth option depending on how often the team targets deep threat Terrance Williams). As a poor man's Wes Welker, Beasley was occasionally effective out of the slot in 2013, but the drafting of Devin Street was a clear sign that the Cowboys expect more production from the no. 3 spot on their depth chart. Unless he winds up in New England someday, Beasley's ceiling is very limited. The Cowboys selection of Terrance Williams with the 74th overal pick in the 2013 NFL Draft spells bad news for Beasley's chances of winning the No. 3 WR spot, as he was already expected to battle Dwayne Harris for the job. Prototypical small, quick slot receiver will compete for the Cowboys' third WR spot. Beasley indicated Tuesday via his personal Twitter account that he will prioritize utilization over money when evaluating the market for his services this offseason, The Dallas Morning News reports. Beasley finished the regular season with 65 catches on 87 targets for 672 yards and three touchdowns. Beasley (ankle) is listed as active Saturday against the Rams, David Helman of the Cowboys' official site reports. Beasley (ankle) is expected to be active for Saturday's divisional-round game versus the Rams, Jay Glazer of Fox Sports reports. Beasley (ankle) will take part in a pregame warmup with an expectation that he'll be active for Saturday's wild-card matchup with the Rams, Adam Schefter of ESPN reports.